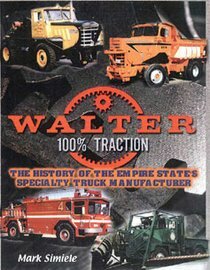 "Walter 100% Traction, The History of the Empire States Speciality Truck Manufacturer" by Mark B. Simiele is the THE definitive book about the Walter Motor Truck company from its 1898 inception to the last trucks produced in 1997. First published in 2000, it is back in print due to popular demand. Hardcover, with 112 high gloss pages and over 300 black and white and color photographs of early Walter automobiles, Tractor Trucks, Snow Fighters, Airport Fire Apparatus and one off special purpose vehicles. A must for the truck enthusiasts library.